"When you push yourself to the edge, the real fun begins." 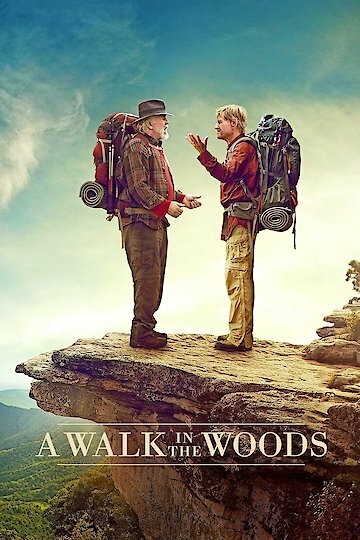 A Walk in the Woods is the 2015 drama about a writer, Bill Bryson (Robert Redford), who after living in London for several years, heads back to the U.S. with his wife Catherine (Emma Thompson). After walking along the Appalachian Trail, decides he wants to walk it in its entirety. Although the trail is over 2,000 miles of deceptive beauty, Bill feels he can gain an inner peace and tranquility that he has never known. Catherine is doubtful that Bill can manage such a feat alone and suggests he take someone along with him. After many declines, Bill looks up his old-time friend, Steven Katz (Nick Nolte), who is game for the challenge, despite being overweight, drunk and not in the best condition. Steven has a number of issues of his own. Although at first glance it seems as though his intentions are honorable, it soon comes to Bill's attention that Steven has debts, and the law is right on his heels. Catherine balks at Bill teaming up with Steven. She knows his reputation, but finally relents once she realizes Bill has no one else to tag along. Once on the hike, the duo finds that the journey may be far more arduous than they ever expected. With each passing day, Bill and Steven run into a number of unpleasant and awkward experiences with other hikers and animals. The duo endures pouring rain, deep snow, heat and several other mishaps that keep them further and further from their goal. A Walk in the Woods is currently available to watch and stream, download, buy on demand at Amazon Prime, FlixFling VOD, Amazon, Vudu, Google Play, iTunes, YouTube VOD online. Robert Redford may not be a young man any more, but there are still a lot of people who like to watch his movies. After this weekend, summer is officially over, and this last movie weekend of the season is going to be a quiet one.